On view in the Thinkspace office area are new works by Brooklyn based artist James Linkous, a 2013 MFA graduate of the New York Academy of Art. Emerge is the gallery’s first presentation of the artist’s work. Linkous explores material transparency and opacity, through his figurative works, as a material trope for the empathetic representation of human character. 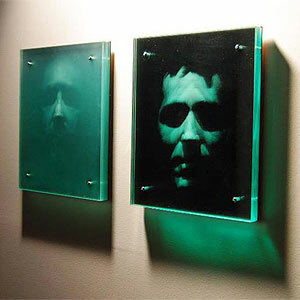 In a series of three dimensional portraits in pencil on plexiglass, Linkous uses the literal recession and emergence of the portrait as a scale to measure the sympathetic representation of the sitter. Central to the artist’s practice is an established tension between the artificial and the organic; the machine and the hand. The works, often mistaken for photography, are in fact meticulously rendered by hand in pencil. The artist’s vested interest in the potential of the individual to supersede the trappings of the impersonal and the general, is felt intensely through the intimacy of these portraits. The artist emulates the perfection of the machine, while subtly revealing the beautifully errant traces of the hand. Ghostly and eerily present, the works seem suspended in time and space. Trapped within the submerged layers of the surface, Linkous captures the visceral presence of his sitters through a material imminence.